Founded in 1997 by chef Eberhard Müller and his wife Paulette Satur, Satur Farms is located on the North Fork of Long Island. 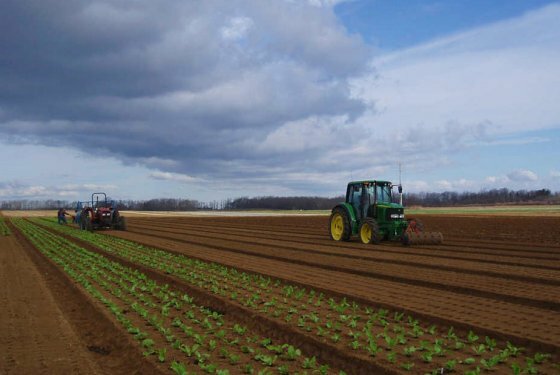 Satur Farms is committed to sustainable farming practices, from the way they maintain and treat their fields, to the safe production of their wide array of vegetables, to providing their employees continuing and livable wages. During the winter months, Satur operates a farm in Florida, yet maintains their commitment to Long Island workers by making sure that all their incredible produce is distributed through their farm on Long Island's North Fork. Beyond these admirable on-site business practices, they share OurHarvest’s commitment to supporting neighbors in need; they regularly donate to food rescue organizations and are involved in local fundraisers for farm organizations. Satur Farms’ delicious produce - including specialty salads, leafy vegetables, heirloom tomatoes, root vegetables, and herbs - is featured at some of the finest restaurants in New York City and Long Island, and once you try it, you’ll understand why!